Comfortable, breathable mesh backrest moulds around user to provide comfort and spinal support. Physio-approved design offers ergonomic support and a range of adjustments. Heavy duty design ensures this chair is suitable for users up to 23 stone limit for 24 hour usage. Sturdy synchronous recline mechanism with integrated torsion control allows user to freely adjust seating position. Integral headrest offers further comfort and encourages positive posture. Gas lift height adjustment allows user to set to comfortable working height between 480-570mm. Stylish grey 5-star base with swivelling hooded castors. 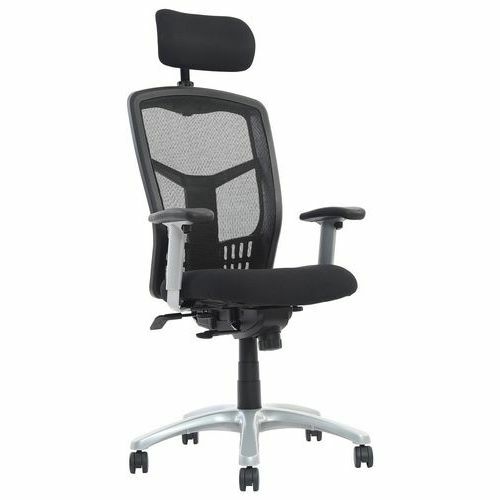 Fully adjustable mesh executive office chair with neck support.